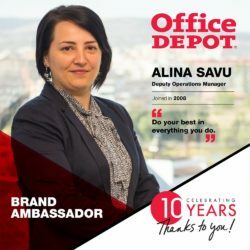 Serious, dedicated and cheerful, Alina is one of our dear colleagues who strives to bring excellence in her work. Not only is she hardworking but also patient in achieving her goals. We are happy to have her as a role model. 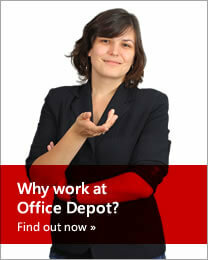 Below you can find more details about her detailed trip in Office Depot. I like to read. I have a quite complex library at home with a lot of books. Recently, I started to read something about French history because I spent my summer holiday in France. I visited some castles there and I wanted to know the story behind them. Also, I enjoy reading detective novels – police is quite a fascinating aspect for me. Besides this, I enjoy watching some psychological movies. I find a similarity between detective movies and the role I am having now. For example, when I investigate some discrepancies in our invoices. So, it’s kind of a detective work we do – trying to understand where the gap is, where we can switch the direction. I like to watch “CSI New York”, “Chicago PD”, and “Criminal Minds” but when I do want to relax a bit I watch “Friends”. My role now is Deputy Operations Manager for the Trade teams in the Accounts Payable Department. Besides coordinating my own team I also help other 3 teams in order to have a solid department. 3. Now going back to the beginning of your journey in OD, can you share with us what your job title was on the first day? I started as an Assistant for the French teams and after the change of structure in our department I became senior in the role and worked with many people. My first role in the team was different from others’. The team consisted of 12 persons but 6 of us were doing the same process with a little bit of differences on specific tasks. When we learned the process in the beginning, I was always behind because I had 3 processes, only one was similar to the others’ and on the other two I had to discover things on my own. So, I had to put the information together in order to understand what is going on. Over the time, I was known as the lady handling Dropship invoices for the team. I remember a funny moment: our team leader shared with us a draft and he did his best to make us understand. He didn’t know what else to do to make us understand. So, he told us to create in the system some invoices to prove ourselves that we understood the process. We tried but it wasn’t such a funny experience to do something like this. We didn’t even know how a French invoice looked like and it was frustrating at a certain point. The next day the team leader helped us and called in France to fax us some invoices to understand them better. A week later, we received a patch of invoices. It was a big box and we even took photos with it because we were so excited. It was at City Plaza Hotel. We were 7 teams from France, around 60 people. It was a day with presentations about the company. What I remember is that there was a presentation about the company values and we were all taking notes – it seemed something really important. Everyone was trying to write everything that was on the slide not knowing that at the end of the day we would receive all the materials printed. It was a lot of information presented and we didn’t know the difference between something that was shared with us to have a better understanding of the company and something that was really important and we needed to have it written down in order to review it from time to time. 5. What was your biggest achievement up until now? Today I’m able to make decisions based on solid knowledge and complex experience. Nine years ago we were discussing some issues we were having in the team and reaching out to our colleagues in France. At some point we were frustrated that we were not even finishing in describing the issue we were dealing with and our colleagues from France, with experience, were able to give us the solution right away. How did they do it? What do they know and we don’t? How can we get that information? How can we arrive at that level of complexity and understanding? I believe right now the situation is pretty much the same because there are colleagues reaching out to me for a solution and they are amazed of how I arrived at a certain solution even though they were checking again and again before asking. I think the experience you gain is important, the situations you encounter, the interesting people that you are working with from whom you can learn a lot of things. So this is something that I’m really proud of. 6. Give us some tips on how to achieve success in one’s career. For me it’s all about hard work. I’m pretty passionate about what I’m doing. When I had an interview at the beginning, the HR team spotted really well at what I’m good at and placed me in the right department. I will also have to add the patience because I didn’t want to burn some steps. I started as an Assistant then got promoted to a Specialist role where I spent more than 4 years. In this role I could see so many situations and gain the knowledge to be a Team Leader. 7. What were the biggest challenges which you faced here? How did you manage to solve it? At some point, at the beginning I guess there were the cultural differences between Romania and France. In 2015, when we made a switch to the European structure I was already familiarized with everything that was happening in France – how we should communicate, how we should grow our relations. It was all about knowing how to adjust different persons to different countries. We realise now that when some colleagues of mine were receiving e-mails in English the tone was a bit aggressive, while when we e-mailed in Italian or French they are more comfortable. We managed to figure this out and now it’s not a problem anymore. Another obstacle was related to the team – when we are searching the right talent for a role. This can take a while and the period for a person to work efficiently may be different from one individual to another. Besides this, we are struggling to deliver the performance we agreed upon earlier without taking into consideration that maybe from a quarter there is a colleague who is having difficulties to perform at the expected level. I think working with so many people, I have learned to know their strengths and weaknesses and use each of them to cover everything in the team. 8. What are the things you love most about OD? Do your best in everything you do. I say this to my team in different words – to try to avoid any superficiality in everything they do. You do it all the way through or you don’t do it. This is a translation of doing your best.